B U S I N E S S 136 • RV PRO • March 2019 rv-pro.com T he effective labor rate (ELR) for any ser- vice operation is an important metric to track and measure, but I find that many dealers have a misunderstanding of exactly what their ELR really represents and sometimes don't even track it. So, let's begin with the definition of the term effective labor rate: ELR is simply what the cus- tomer actually paid for the time charged on the repair order. The customer can be a retail customer, a warranty customer or an internal customer – it makes no difference. (This rate, of course, can be different for all three labor types.) Here is the formula for calculating ELR: Labor dollar sales divided by the number of hours billed on the repair order equals the rate actually charged for the repair (ELR). There is another school of thought that has a different formula: Labor dollar sales divided by the number of hours you paid the technician to complete the work on the repair order. Either of these two formulas can provide you with the same result when it comes to measuring your profit margin for each hour you sell in the service department. Look at Figure 1 on page 138 as an example of measuring your profit margin. Figure 1 is a good example of a proper sales- to-cost-of-sales structure for a properly managed service department. Many dealers believe their ELR is $125, but in reality there is one key metric that is missing – a technician's hours produced as a percentage of clock hours actually worked. Let's call this "technician productivity." Here at DealerPRO RV, we work with a lot of RV dealers onsite in their dealerships as well Most dealerships have good service techs, but they are not necessarily reaching their full potential. To change that, management must identify what needs to change in order to capture those opportunities and implement a performance-driven training plan that gives employees the skills they need to become top performers and break out of their comfort zones. 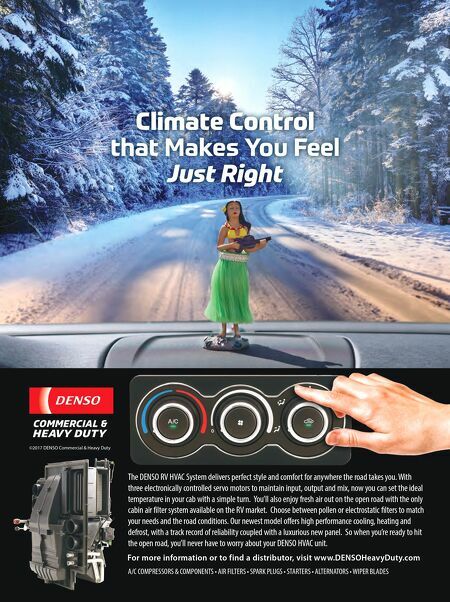 By Don Reed Don Reed is the founder and CEO of DealerPRO Training Solutions based in Gahanna, Ohio. For more information, visit www. dealerprotraining. com. Reed can be reached by calling 888-553-0100 or via email at dreed@dealer protraining.com. What Can You Learn from Your ELR? 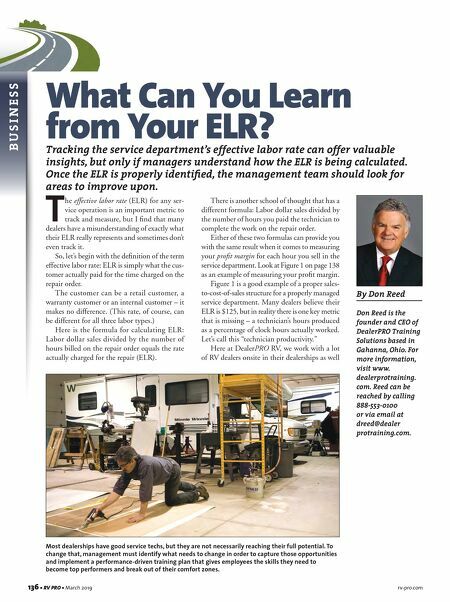 Tracking the service department's effective labor rate can offer valuable insights, but only if managers understand how the ELR is being calculated. Once the ELR is properly identified, the management team should look for areas to improve upon.